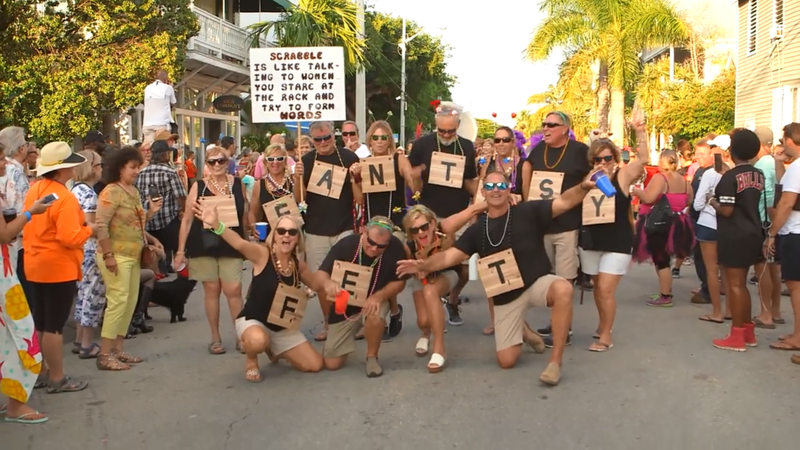 More than 10,000 costumed revelers staged the high-spirited Masquerade March through Key West’s historic Old Town as a prelude to Saturday night’s lavish Fantasy Fest Parade. Friday evening’s procession was a highlight of the island city’s 10-day Fantasy Fest, a masking and costuming celebration that runs through Sunday. The 2018 festival is themed “Oh … The Games We Play!” and salutes games ranging from Monopoly to immersive role-playing adventures. Beginning at the Key West Cemetery, the march drew participants wearing elaborate masks and costumes, offbeat accessories and ensembles inspired by the festival theme. Notable marchers included a Candyland troupe in tutus and tall confectionary headdresses, a man garbed as a huge walking roulette wheel, a 30-foot meandering caterpillar and people wearing Scrabble letters, forming words as they walked. While the colorful march attracted thousands of participants and spectators, Saturday night’s Fantasy Fest Parade is expected to draw some 60,000 party-goers. They’ll line the island’s Whitehead and Duval streets to revel in several dozen elaborate motorized floats, costumed marching groups and lively island bands. Fantasy Fest ends Sunday night after a children’s carnival and a poolside dance party.